... Not that he wears socks. But if he did, they would have been vapourised. 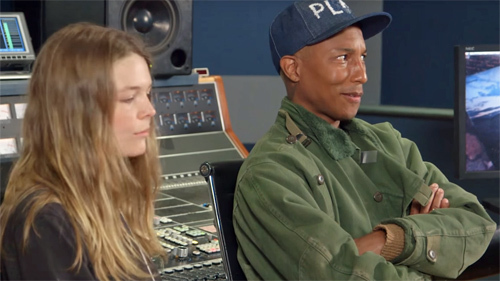 The singer was hosting a masterclass for music students at a New York university, when a student called Maggie Rogers was given the opportunity to play him one of her songs. "I grew up as a banjo player and always loved folk music," she explained. "I came to school here to make folk music... very straight-ahead folk music. But I stopped making music for a couple of years in the middle of school. [I] went through some things and developed and learned some more about myself, and I studied abroad in France and had a really spiritual experience with dance music there. "And suddenly this thing that had always been the most unnatural and the most artificial, I understood the release of it. That since there was a fire, people have been beating sticks together. So I just started making music again a couple of months ago, and I can't make enough. All I want to do is combine that folk imagery and harmony and natural samples that I've been picking up while hiking with the backbone and energy of dance music. "We'll see if I'm successful..."
She then cued up her track, called Alaska, and sat squirming while Pharrell listened to it in the chair next to her. As the first chorus kicks in, his eyes grow wider and wider... The reaction is priceless. "Wow," he says as it ends. "I have zero notes. Your whole story, I can hear it in the music." Here's the video in full. Maggie's segment starts at 18'14". The clip has slowly gone viral since it was uploaded to YouTube in March. Now Maggie has put the finished track up on her Soundcloud page. It really is worth three minutes of your time. Totally beautiful and utterly unique - a star is born.